This premium acrylic lipstick organizer comes with 24 individual spaces for storing standard sized lipsticks. Please see our 'oversized lipstick organizer' listing for storing those lipsticks with larger bases, such as (but not limited to) -buxom, Kat von d studded lipsticks, YSL, tom ford, Sephora rouge shine, Giorgio Armani, mac mineralize lipsticks, marc Jacobs. 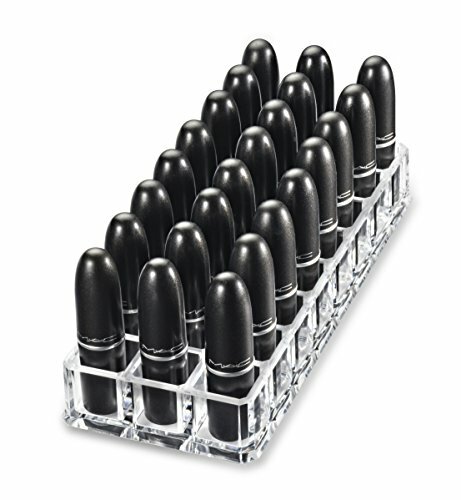 The size of this 24 lipstick holder is: 8.6lx3.5wx1.4h" w/.85" inner cubes. Enjoy world class shipping & customer service provided by amazon on all byAlegory premium organization products. Our makeup and beauty product organizers make a great gift idea for friends & family. And don't forget to hashtag your new byAlegory photos and follow us to receive amazon discounts on current and future byAlegory products! For international customers please check your local amazon site for availability of our listings. Inspired by professional makeup artists, you will notice the difference in all byAlegory products when compared to the industry standard. From design to durability to functionality, you will instantly notice a difference in the feel of its weight, the look of its color and realize the lasting durability from the moment you pick it up. Imagine owning a high quality and durable makeup organizer that you will be instantly satisfied with and every day after. Our products are tailored to match a wide range of decor, whether it be in your personal bathroom, a vanity area or your salon, our premium quality acrylic organizers are made to visually stimulate and highlight your beauty products. Please note beauty makeup products inside acrylic storage container shown are not included and are for demonstration purposes only. ByAlegory is a registered trademark under alegory racks. And is the only authorized reseller of byAlegory premium beauty organization.